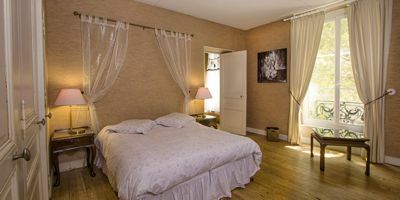 Maison Juliette is a beautiful and luxurious private house with a garden in the center of Carcassonne. With four bedrooms and three and a half bathrooms, it sleeps nine people, all in real beds – perfect for large families or groups of friends. We can easily accomodate a mix of singles and couples, since three of the four bedrooms can be configured with queen or single beds. The traditional design from the 1860s has been recently updated, to offer the best of old-world tradition and modern comfort. 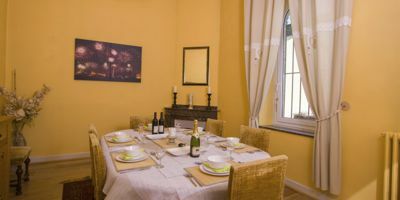 Maison Juliette’s owners completely rebuilt the kitchen in 2008, to create a modern space for cooking gourmet meals and relaxing as a group. There is plenty of counter space and casual bar seating for six people. 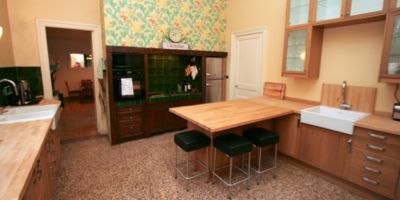 The kitchen includes a four-burner stove, oven, microwave that doubles as a second oven, and steam oven, plus plenty of cooking dishes and utensils. A full-size refrigerator plus a second undercounter refrigerator means you won’t run out of space. Coffee drinkers will like the automatic coffee maker and tea drinkers have an electric kettle. To speed cleanup, there are two sinks plus a dishwasher. The pantry is stocked with basic cooking items: salt/pepper, oil/vinegar, spices, etc. Traditionally, summer kitchens were used for cooking on hot days, to avoid heating up the main house. Now, the summer kitchen provides a casual eating area, with a sliding patio door to the garden. There’s also an undercounter refrigerator here, for storing drinks. The formal dining room can seat expand to seat ten people. Located just off the kitchen, the laundry room has a full-size washer and dryer, so you don’t have to wash clothes by hand, even for a long stay. 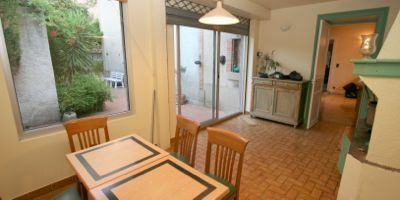 Maison Juliette has two living rooms, both opening to the garden. Both rooms can be closed off for more privacy. The formal “salon” has a leather couch and two chairs, plus a TV/DVD hidden away in a cabinet. The more casual library has two couches facing each other, and a computer desk. There’s a bookcase stocked with travel guides, maps, and novels in English and French. The library also has a bar that is stocked on the honor system. 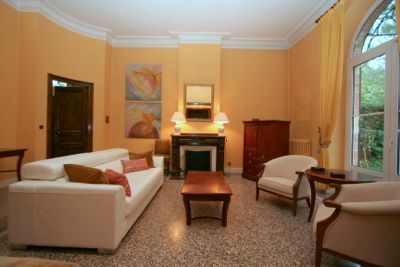 The upper floor has four large bedrooms, all with decorative marble fireplaces. Two bedrooms have private bathrooms and the remaining two bedrooms share a common bathroom. We can easily accomodate a mix of couples and singles, since three of the four bedrooms can be configured with queen or single beds. See floor plans to see how the bedrooms and bathrooms are arranged. Master bedroom: private bath, queen or single beds, large closets, garden view. 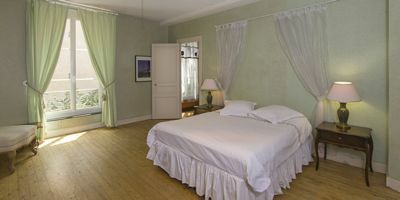 Largest green bedroom: shared bath, sleeps three (queen and single or three singles), small closet, garden view. 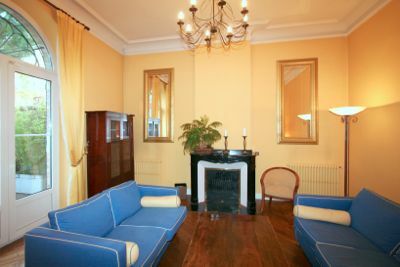 Blue bedroom: shared bath, queen or single beds, armoire, street view. 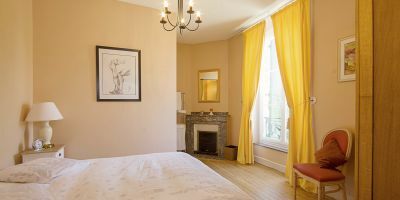 Small rose bedroom: private bath, queen bed only, armoire, street view. 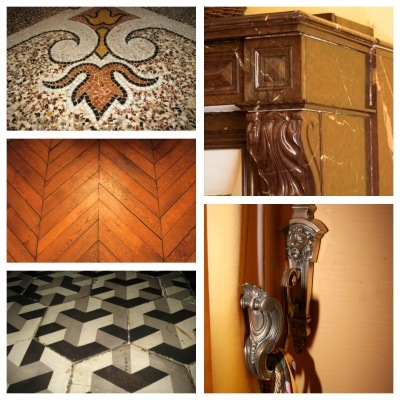 Luxurious old-world details abound: 12-ft high ceilings, spacious rooms, marble fireplaces, mosaic terrazzo floors, chandeliers, and beautiful curved wooden doors. Modern comforts haven’t been forgotten. The house has WiFi and a USB printer. There’s a TV (French channels only), plus a DVD player with a library of 100+ videos, both French and American films, plus some children’s videos. We provide both an iPod stereo and a regular CD player with a collection of 100+ CDs. We have a handful of plug adapters, so you can charge your electronics. A south-facing walled garden with brick patio offers a beautiful oasis where you can enjoy the outdoors in privacy. 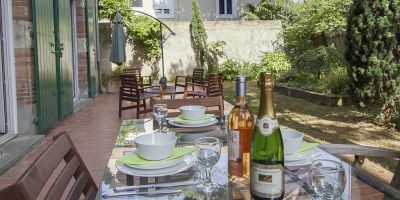 There’s a gas BBQ, outdoor dining tables to seat ten people, plus four teak arm chairs and a large shade umbrella, so you can relax with a book in the French sunshine. We’ve included helpful touches to make your stay comfortable: bar stocked on the honor system, hair dryers, curling irons and straighteners, fluffy cotton robes for everyone, electric plug adapters, brochures and maps, rolling shopping cart, umbrellas, travel books, and CD and video collection.